Birmingham-based mutual Wesleyan will again sponsor Birmingham Children’s Hospital’s ‘The Big Bandage’ fundraising event this summer. 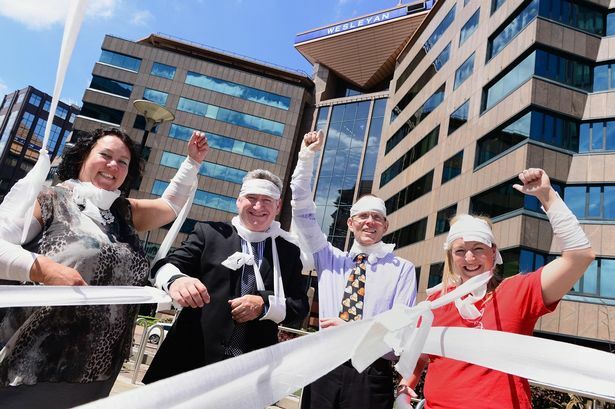 Taking place on Friday July 10, The Big Bandage is a day of fundraising activities across Birmingham and the West Midlands, with people encouraged to show their support by going to work or school wearing a bandage. It is the third year Wesleyan has been the lead sponsor. Last year more than 35,000 people from across the region raised more than £80,000 for the hospital’s Children’s Cancer Centre. This year it is hoped £100,000 will be raised for the hospital’s new £1 million appeal for Magnolia House, a purpose built facility that will provide a haven for families after they have received upsetting or life changing news. Liz McKenzie, Wesleyan’s group corporate services director and chair of its charity advisory committee, said: “As a company, we are proud to see the difference our fundraising is making to the children from Birmingham and across the whole country, and we call on other local businesses to get involved in this fantastic day of activities. Louise McCathie, director of fundraising at Birmingham Children’s Hospital, said: “We’re delighted Wesleyan has chosen to support our Big Bandage campaign again. Its commitment to fundraising is second to none and we wouldn’t be able to run the event without its generous support. To register support or make a donation visit www.thebigbandage.org.uk.